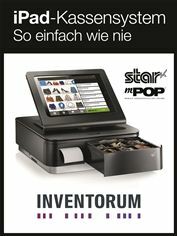 With the explosion of mPOS and the emergence of software companies responding to this evolving marketplace, it comes as no surprise that INVENTORUM has chosen Star’s low cost high performance Bluetooth POS printing solutions as well as the unique TSP143IIIU that have been installed in major retail and hospitality applications worldwide. INVENTORUM is a point of sale, inventory management, live reporting, customer Management, Bookkeeping and E-Commerce all-in-one iPad app. The POS system provides everything retailers need to keep track of each distribution channel anytime and anywhere as consumers increasingly expect the same shopping experience regardless of where they shop. The easy to use iPad app can also open a web shop with just a mouse click. Combining the cash register, inventory management and online shop on a mobile platform, INVENTORUM’s intuitive design helps small retailers remain competitive by optimising the daily processes in a retail store while effortlessly integrating an online presence. One of many features to be included provides retailers with the opportunity to sell vouchers directly from the POS system. A voucher is created with a pre-determined value, is printed alongside the receipt and contains a barcode and a voucher code for redemption. The vouchers can be redeemed for any product with the retailer simply having to scan the barcode or enter the coupon code. For a high performance countertop printer the latest addition to the renowned TSP100 futurePRNT™ series from Star is the unique TSP143IIIU – the only USB receipt printer today to communicate and charge simultaneously and directly via the Apple supplied lightning cable with an iPad, iPod or iPhone for reliable USB communication. This printer removes the insecurity of wireless connection and seamlessly combines the flexibility and cost savings of tablet POS with the reliability of traditional POS. Using the TSP654IIBI receipt printer from Star, INVENTORUM is able to offer a seamless and efficient service to its customers. Star’s TSP654II series provides a unique, high speed 300mm/second entry-level solution with multiple connectivity options for traditional or Cloud based systems, providing a traditional connectivity solution today and a Cloud printer tomorrow by just changing the interface, at a much lower cost than replacing the printer. For retailers looking for a combined Bluetooth printer and cash drawer solution Star’s mPOP is low cost, lightweight and space-saving at just 10cm high and 30cm wide. With front feed receipting, mPOP can easily be placed under the counter for enhanced space-saving. Working with all major operating systems including Apple iOS, Android and Windows, mPOP provides users with a versatile Bluetooth solution that is ready to work with compatible POS software and a card payment system. With the POPPack option that includes a high quality black or white tablet stand (alternative colours are available if required) and metal plate, users can successfully create a stylish mPOS station. The POPPack design provides a flexible option with the extra security required within a retail environment, whilst retaining the mobile element. This provides the ability to securely store or transport the mPOS station at the end of trading. “We are glad to have a partner like Star working closely with us. Receipt printers are an important integration to our POS solution and the latest Star devices mirror the ease of use we pride ourselves on. The well designed mPOP printer and cash drawer combination is in-line with our small footprint philosophy and style consciously matching the Apple iPad our System runs on,” says Christoph Brem, Founder and CEO of INVENTORUM. INVENTORUM is offering free tickets to interested retailers for the Trade Fair. Please email tickets@inventorum.com until 26 February 2018 to get your eTicket.